Thank you for your interest in the Link Union Station Project! The Los Angeles County Metropolitan Transportation Authority (Metro) appreciates your input in this early phase of the project development process. We are grateful for your involvement and comments as we determine the optimal realization of this project for our customers, regional transit riders and the communities we serve. Thank you again for your input and we look forward to continuing the conversation as we work together to transform LAUS into a world-class station. The public comment period for the Link US Draft Environmental Document closed at 5:00 PM on March 4, 2019. All comments related to environmental topics will be addressed in the Final EIR. An electronic copy of the Draft EIR and appendices are located here starting January 17, 2019. The Notice of Availability is located here. 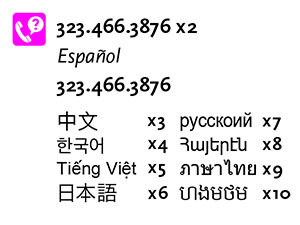 Executive Summaries are also available in Español, 中文, Korean, Cambodian, Vietnamese, and Japanese.